Pinterest. It's a powerful tool fraught with many pitfalls. In addition to being an easy way to waste time, it can also make you think it's normal to make yogurt in your DIY crockpot every morning in your designer kitchen that's stocked with homemade lavender soap and French linen towels, while your children sit quietly, enjoying their seasonal sensory play boxes with organic crocheted slippers on their feet. There are a ton of super gifted people and inspiring ideas out there, and I truly would like to master the art of yogurt making. But the trouble is that Pinterest is a collection of everyone's best moments that has the potential to warp the picture of what normal life can and should be. I guess for me the bottom line is that our worth and value as people is not dependent on what we do or accomplish. We have worth and value because God decided that we should be alive in the space and time that we are, to reflect his beauty and love in a broken and hurting world. He is the first Creator, and we get to be like him as we create beauty and order in our lives and homes. There are also some pretty awesome Pinterest fails out there. These cookie monster cupcakes are pretty great. And how about this minion cake? So much genuine effort gone awry. It's always good to see that people are just people. Nobody's perfect. I'm not anyway. So, I just figured I'd share my own fail. A rather disappointing one, in fact. 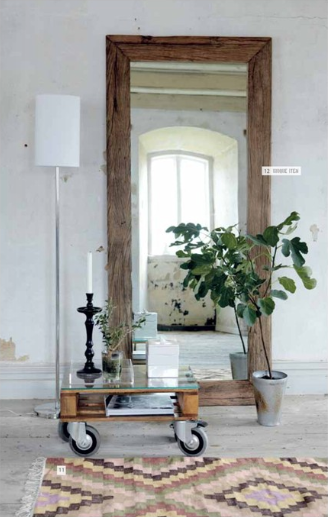 Soon after I found Pinterest several years back, one of my first pins was this beautiful rustic leaning mirror. For some reason, I always knew that someday, somehow, I would make one myself. Tall mirrors are expensive, so I just kept my eye out for a thrifted one. I found a floor length mirror (glued onto a door) at the ReStore for $10. I've had it in storage for almost three years now, basically just waiting for the weathered lumber to find me. You can imagine my delight when I spied a giant pile of weathered pine by the curb a few weeks ago. It seems that someone tore down an old shed or something. It was raining, so I couldn't tell if the patina on the wood was the right color, but I hauled most of it home, and let it dry in my basement. It was perfect, with some really nice weathered details. Here's the door with the mirror. I tried removing it, but it was stuck tight. I didn't want to break the glass, so I decided to just build the frame around it. Speaking of my brother and miter saws... Look what he made for me a few months back. He found the weathered oak at an old abandoned house in Arkansas, brought it back on the airplane—the wood, not the house— and surprised me for my birthday. He's pretty great. Back to the story... It was after dark when I got everything screwed in firmly, so I just propped the mirror against my fence for the night. Pete could help me move it inside in the morning. Apparently, I screwed the warped boards a little too tightly against the glass, and the pressure caused the crack overnight. I was really bummed, but there wasn't much to do about it. The good news is that, since I used the garden stakes as a frame around the door, I was able to effectively remove the door and broken glass, while still keeping the weathered frame intact. I added some screws and "L" brackets, and my frame is now quite sturdy. Mirror-less, but sturdy. We have a separate little closet/dressing area in our room that's a perfect spot for a full-length mirror, so here it is in it's new space. It's obviously not a very satisfying after shot, but it's real life. I've been sprucing up this space lately for an upcoming project/collaboration, so definitely check back for more in the coming weeks.